I have a couple different power banks and when Lumsing offered one for me to review, I accepted. 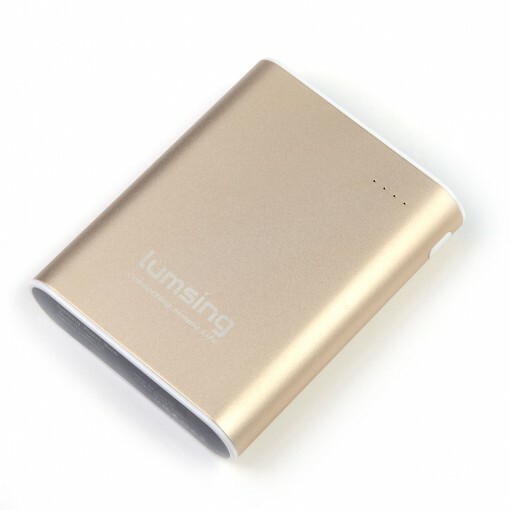 This gold-colored power bank from Lumsing has a really powerful output and super high capacity with 13400mAh. That’s usually good to charge my phone to full power three times. But the Lumsing Grand A1 Plus 13400mAh Portable Charger External Battery Power Bank (Gold) can charge any phone, tablet, or other device very quickly as long as it can connected with a USB (which most devices do nowadays). Though not the smallest charger out there, it’s not the largest either for it’s capacity. The Lumsing still has somewhat of a compact design. Without bringing out a tape measure, I’d estimate it’s larger than a credit card and about as thick as two Samsung S6 phones laid on top of one another. The size isn’t a problem when considering how much punch this thing packs. The Lumsing external power bank is a good solution for those that are always carrying a bag or backpack — as I do. My only wish was that Lumsing had a display that showed the power percentage of the bank, instead of just a dot gauge. I like to know exactly how much power is leftover. The size and the lack of percentage isn’t a big problem, but it’s something I hope Lumsing considers for future versions. If you’re interested in the power bank, you can use the following code for five dollars off. Just place this coupon code in at checkout: 3K6W2FSY The code is valid until March 27, 2016. ** My review for this power bank, though provided for free, won’t affect how I review the product negatively or positively.